Migrante International condemns in strongest terms the brutal killing of Gustavo Alejandro Salgado Delgado, Director of the Frente Popular Revolucionario (Popular Revolutionary Front) and a staunch defender of migrant workers’ rights. Delgado was found murdered, tortured and decapitated in the state of Morelos, Mexico on February 4. Delgado was involved in an organization of migrant workers in eastern Morelos demanding livelihood and better living conditions. Migrant indigenous groups, mostly agricultural laborers, are campaigning for livelihood in eastern Morelos State. Many of them were displaced by violence and natural phenomena that have been wreaking havoc in the communities of La Costa Chica and Montana de Guerrero over the years. The FPR led their demands for better conditions of living, work and education. They pressed for government attention, thereby installing the Migrant Indigenous People’s Camp. Delgado himself was stationed there over the last four months of the camp to organize and attend to the demands of the families. His work went back and forth between attention to the camp and the community of Emiliano Zapata (Chivatero) where he was working to get the support of families for the management of FONHAPO with respect to natural resources. He also campaigned for the surfacing of the missing 43 students of the Rural Normal School “Raul Isidro Burgo” in Ayotzinapa, Guerrero. He also promoted the building of the National Assembly of Proletarian Workers and the Peoples of Mexico, and pushed for the realization of the General Political Strike of Mexico. As migrant workers and advocates, we condemn the state impunity being exercised by the regime of Enrique Pena Nieto, whose hands are also stained with the blood of the 43 student activists who were kidnapped and killed in Iguala, Guerrero, Mexico last year. Delgado was a threat to the government for his leadership of the mass movement against the repressive and fascist regime. The death of Delgado is the latest in the series of extrajudicial killings, abductions, tortures and political harassment of activists in Mexico. Migrante International gives highest tribute to Delgado. He is a martyr of migrant workers and a martyr of the working people. His death inspires migrant workers all over the world to continue to struggle for their rights and to call for an end to modern-day slavery and the violence it perpetrates on the working people. 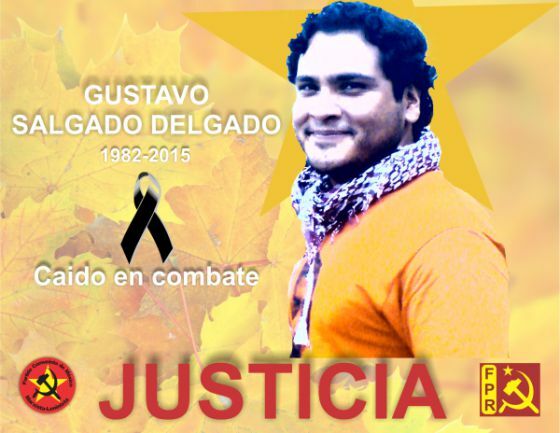 Justice for Gustavo Alejandro Salgado Delgado and all victims of state violence! This entry was posted in News, Statements and tagged Frente Popular Revolucionario, Gustavo Alejandro Salgado Delgado, Mexico, migrant workers, Popular Revolutionary Front. Bookmark the permalink.